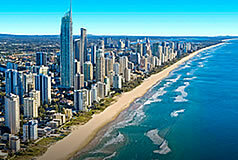 Beach Haven on Broadbeach offers guests one of the most impressive locations available anywhere on the Gold Coast. One of the most popular family beaches, with park land and playgrounds, is directly opposite and the renowned Broadbeach restaurant and shopping precinct is just a two minute stroll from the door. The fully self contained two bedroom Broadbeach holiday accommodation is ideal for families who want to be at the hub of the Gold Coast. Beach Haven is also a perfect choice for.... Read More. 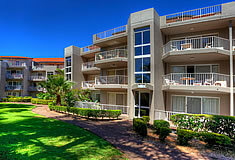 Markham Court is set in a sub-tropical oasis and just minutes from the beach. 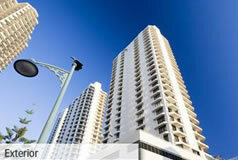 Our Broadbeach apartments are truly a home away from home. The resort offers spacious fully self contained 2 Bedroom apartments and 3 Bedroom split level Penthouses with spa and wrap around balconies that overlook lush tropical greenery and manicured gardens. 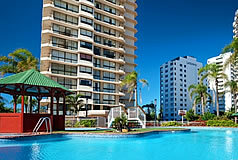 Most apartments have air conditioning and all have the latest LCD TV and DVD... Read More. Luxury Broadbeach Accommodation - The Wave Resort is perfectly positioned in the heart of the café & dining precinct of Broadbeach. 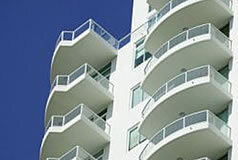 The Wave offers guests luxury accommodation in spacious 1,2 & 3 bedroom apartments which all enjoy an east facing aspect. 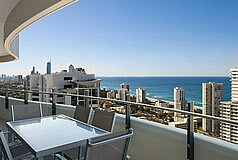 Private balconies are designed to make the most of the stunning views which sweep the entire Gold Coast and Broadbeach region. With each apartment being equipped with state of the art gourmet kitchens &... Read More. One of Broadbeach’s landmark high rise buildings, Carmel by the Sea is superbly located beachfront in the heart of Broadbeach. With stunning ocean, waterway and hinterland views, Carmel by the Sea has 125 two and three bedroom apartments and luxury penthouses, beautifully appointed with modern facilities and all apartments have high speed elevator and security access to your level.... Read More. 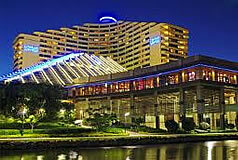 Jupiters Gold Coast is the ideal location for one of Australia's best hotels. Jupiters Gold Coast boasts a variety of accommodation options with 594 superbly appointed guest rooms, including 29 suites and two penthouses with private balconies or sun terraces. Imagine what you could get up to.... Read More. Offering a range of one, two and three bedroom fully self contained, air conditioned apartments, Paradise Centre apartments provides spacious accommodation right in the heart of Surfers Paradise. 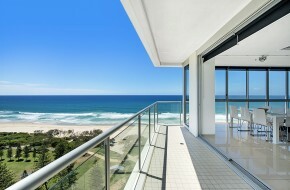 With ocean views visible from every apartment, sit back and relax on your balcony while taking in the stretch of coastline the Gold Coast is famous for.... Read More. Spectacularly located in the heart of Broadbeach, ULTIQA Air on Broadbeach features beachfront holiday accommodation fused with city sophistication. Choose from one of the Ocean View Apartments or Sky Villas for a superior holiday experience..... Read More. The Gold Coast is surely a golfer's paradise with over 20 courses within a 45 minute drive of Braodbeach appartments, but we also have options in other locations to suit your requests... Read More.